It's Wednesday...er Tuesday! And that means it's time White Dwarf. Ok, with the A to Z posts and the S&W Appreciation Day it is going to be a busy day of posting tomorrow. Today. Not so much. So instead of giving you WDW late, I figure early is better. So let's begin. White Dwarf Magazine #61 is our first issue of 1985. The first thing we should notice int he increase in price to 95p or $3.00 here in the US. Well that and the cool cover, which is again a Chris Achilleos one, but I think it must be an older one. Ian Livingstone has some bits about things coming up in future WDs, but no mention of the price increase. Oliver MacDonald is up first on more alchemy for RuneQuest. I devoured all sorts of articles like this; I always wanted more out of the magic I was doing in AD&D and games like RQ seemed to have all those things. Or at least that was my perception at the time. Open Box is a BIG one for me personally. Let's dive in. First up is the review of the LONG awaited Companion Rules for the D&D Basic game. I discussed my own history with the Companion Rules before, but long story short I had already gone the route of AD&D (and other games) by this time. To me, this Companion Set was too little, too late. Megan C. Robertson (whom I also consider a friend and have worked together a number of times) gives it only a 7/10. At the time I would have given it lower, but today it would have fared better. So I can't disagree with her logic. Next is TimeMaster from Pacesetter. Man I really, really wanted this game back then. I was (and still am) a HUGE Doctor Who fan and at the time this seemed like my best bet for getting a Doctor Who game going. I never got to play TimeMaster though I do own it today. Steve Norledge gives it and it's associated adventure both 7/10. Also reviewed is a game I never get tired of talking about, Chill. Also from Pacesetter, Chill was MY horror game. Not as in "I wrote it" but as in I loved it. Angus M. McLellan gives it 7/10 and the adventure Village of Twilight a 6/10. I would have given it more myself. Witch Hunt is an odd little game and it is next. I also owned this game. While playing it and Chill I came up with a number of things that would later become part of my games today. Certainly my Witch book has some DNA from these two games. Jon Sutherland only gives it a 5/10. Actually that is reasonable since re-playability was low in my opinion and the rules were not great. Lastly we have Indian Jones. A lot has been said about this game. Andrian Knowles gives it a 7/10 and that is very generous. A bit on Critical Mass. Dave Langford reviews Job: A Comedy of Justice by Robert A. Heinlein. I read Job at about this time as well and really, really enjoyed it. It might very well be one of my favorite RAH books along with Friday. I have never seen this cover for it before. Part 3 of Eye of Newt is back. Great ideas that didn't see an official counterpart till 15 years later. Mix it with the Alchemy article for some good magic-based fun. Andy Slack has some Traveller ideas on how to motivate characters (other than just money). Beyond the Shadow of a Dream is next. It is an adventure for Basic D&D or Fighting Fantasy, though it is not a programmed adventure. Kudos for WD for trying something new. There is a defiant influence of Traveller of Call of Cthulhu here in this adventure design. Letters talking about how boring the letters page is. 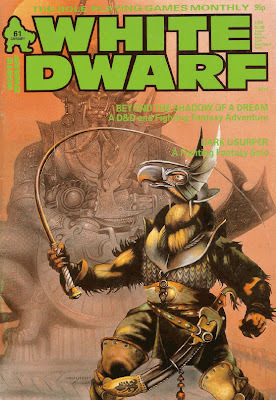 A programmed Fighting Fantasy adventure is next. Four pages and 104 entries. The last part of Superhero games by Simon Burley. In particular he looks at various other world for Supers games like high fantasy and sci-fi. I have seen similar treatments in various Supers books out now, but it is still interesting to read this system-free point of view. Fiend Factory continues with AD&D stats (thought we would be going to CoC or RQ stats as well). Al sorts of weird bugs. Perfect if you were running Q1 at the time (and we were). RuneRites has some treasures, including the Ray Harryhausen inspired Fang Warriors. Treasure Chest has an adventure contest. They provided the map you provide the scenario. Tabletop Heroes gets shoved to the back of the magazine. Must be all those letters they got. Rumors: A new West End Star Trek Game. Mayfair gets Sanctuary. More Marvel Superhero books coming out. Followed by ads and small ads. A good issue. 1985 starts out big for WD and it will get bigger. Issue 62 has one of my favorite adventures and soon we will see the end of an era. I loved the Eye of Newt series. Going to use it when my players plan on creating magic items. Wow, they sure took their time getting around to reviewing Witch Hunt, didn't they? My copy shows a copyright date of 1983 (and the supplement/adventure "A Tyme of Darkness" is from 1984). I've always been intrigued by the "Braunstein"-like ideas involved. It's one of the few games I own from the 1980s that I never got to play.